Containment Protocols: RPC-204 is to be contained in a 4 meter by 4 meter standard humanoid containment chamber 20 kilometers northwest of Site-002 at all times. This containment chamber is to be labeled as "Site-002 Fallout Shelter". As of 27/1/1998, RPC-204 is to be contained in the abandoned town of [REDACTED], Slovakia. At least 100 CSD personnel must occupy this town at all times to prevent RPC-204 from leaving. All instances of RPC-204-1 manifesting in nearby villages must be reported immediately, followed by the administration of amnestics to all inhabitants of the affected village. If RPC-204-2 occurs in a surrounding village, MST Delta-13 "Men In Black" has been assigned to contain all inhabitants and assign the CSD designation. If a test involving RPC-204 is scheduled, it must be transported utilizing aircraft to the scheduled test area. Currently, RPC-204 has not physically attacked any personnel, and thus, it is to be considered docile. A modified tracking device has been implanted on RPC-204. If RPC-204 attempts to breach containment, this tracking device will automatically stun RPC-204. However, RPC-204 has not attempted to breach containment since 27/1/1998. Replication of RPC-204-1 Broadcast from the Third test of RPC-204. Note the Emergency Management Queensland logo as opposed to the seal of the government of Australia. Description: RPC-204 is a humanoid entity standing at approximately 180 centimeters and weighing approximately 73 kilograms. 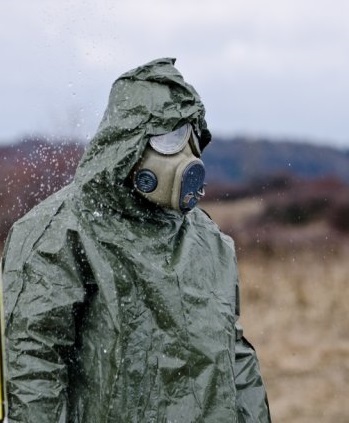 RPC-204 wears what appears to be a Czech CBRN suit roughly equivalent to a model from 1993, however, inconsistencies have been sighted with the suit itself. RPC-204 has been confirmed to be anatomically identical to a human male from the age range of 30-34, with the exception of greenish-grey skin. RPC-204 requires no external sustenance, suggesting a presence of self-regeneration. RPC-204 appears to be immune to all forms of damage that would be fatal to an average human, but has been injured from testing. RPC-204 appears to only have a basic concept of socialization and language, as when it is approached, RPC-204 will vocalize survival information for nuclear blasts in the Czech language. Despite wearing an M10-M gas mask at most times, RPC-204's vocalizations sound as if they are unobstructed. As of 9/5/1999, It has been found that RPC-204 can not make these vocalizations without its gas mask. RPC-204's anomalous properties manifest when RPC enters a populated area of any population size Over 250 individuals. Upon entrance, Multiple instances of RPC-204-1 will trigger, followed by the triggering of RPC-204-2 approximately 15 minutes later. 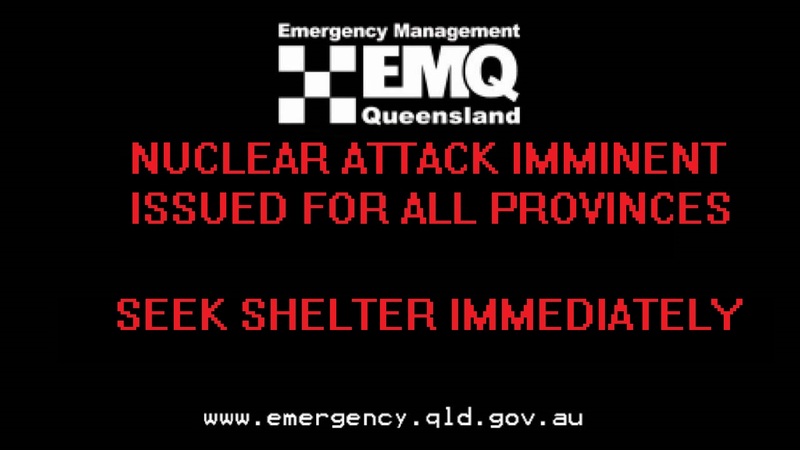 During this period, All residents will appear in a state of panic, frantically searching for "Fallout Shelters." After the triggering of RPC-204-2, All humans within the area affected will hallucinate the same post-apocalyptic scenario, reacting differently to their situation according to their pre-RPC-204-2 manifestation mental state. RPC-204 will only leave the area when approximately 75% of the population of the area dies when either approximately 75% of the area's population dies, or if a "Peace Agreement" is reached. Upon RPC-204 leaving an area, the remaining population will no longer hallucinate, yet retaining memories from the hallucinations. This often leads to suicide in most individuals. Those who do not commit suicide upon the conclusion of RPC-204's anomalous properties will express a strong desire to neutralize RPC-204. 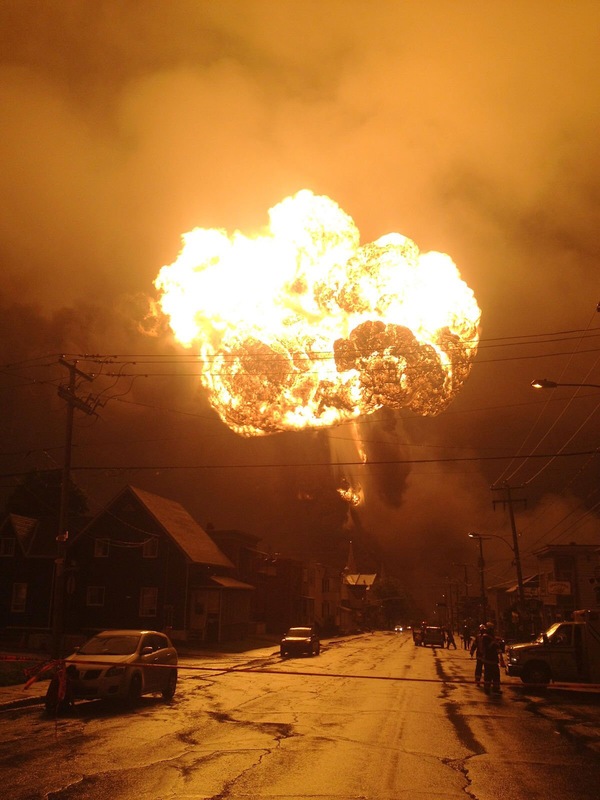 Procedure: The abandoned town of Kitsault, British Columbia, Canada was chosen as the sight for the initial test of RPC-204. The town would be populated by 670 CSD personnel. Outside of the construction of a sporting goods store with a sizable amount of firearms, The placement of cameras to watch the test, and the placement of televisions in every house, Kitsault was not interfered with. Test variables were not modified, allowing factions to naturally occur if any were formed. Results: Upon the entrance of RPC-204, The Alberta Emergency Population Warning System displayed on all available television sets, despite Kitsault being located in British Columbia. RPC-204-2 manifested exactly 15 minutes after the start of the broadcast. 4 hours later, all 670 CSD personnel have awakened, and proceeded to scavenge the town. Two factions were observed the next day, with entirely different motives. The first, Columbia's Sword, appeared to take many influences from The United States during the Second World War, wearing olive green clothing with crude white stars painted on. The other, The Iron Rail, appeared to take influences from the German Reich around the same period. On Day 3 of the test, a notable armed conflict occurred between both factions. When 167 inhabitants out of the original 670 were left alive, RPC-204 attempted to leave the town. Before it did so, it was captured by Authority agents and quickly re-contained. All remaining individuals overlooked the casualties from the conflict, many taking their lives. Those who did not were administered amnestics and put back into service as CSD personnel. Procedure: The abandoned village of [REDACTED], Slovakia was chosen as the site for the second test of RPC-204. Only 247 CSD personnel were assigned to populate [REDACTED] for this test. No modifications were made to [REDACTED], due to its recent abandonment. Results: Upon the entrance of RPC-204, no broadcasts appeared to manifest. After 24 hours of no anomalous manifestations occurring, The test was ended, with all CSD personnel going back into regular CSD duties. [REDACTED] was assigned as RPC-204's containment site on 27/1/1998. Procedure: A fake settlement, known as Kelly, was built in the desert region of Queensland, Australia. A fake museum, dedicated to notorious Australian criminal, Ned Kelly, was built was built in the center of town. The scheduled variable was an attempt to force the formation of factions. Thus, retractable walls were built through the center of the town, cutting the museum in half. The museum has been filled with firearms, most commonly L1A1 SLR's and AKM pattern rifles. Two researchers, including Head Researcher Lahtinen, would be part of the experiment to guide the formation for the planned factions, and are thus to equip special "faction leader" armor located inside of the museum. 1000 CSDs were assigned to populate Kelly, with 500 going on each side of the town. Each side has been equipped with a radio, with the "Constable" radio linking to a broadcast originating from London, while the "Bushranger" radio connects to a station located within Site-002. Results: Upon the entrance of RPC-204, The Standard Emergency Warning Signal, Australia's Emergency Warning System had activated. 2 minutes after the manifestation of RPC-204-2, both researchers infiltrated the town. Lahtinen took the role of "Ned Kelly", while a second researcher, William Carrington, took the role of "The Viceroy." Upon the awakening of both groups of CSD, both "leaders" directed their group of CSDs to the museum. Both groups equipped themselves with "uniforms"1, and firearms and were directed back to listen to a radio broadcast. After doing so, both groups were told to shoot the other group of individuals on sight. The retractable walls proceeded to retract, allowing both sides to engage each other. The brief skirmish lasted for 2 days. RPC-204 attempted to leave when 251 survivors, almost all belonging to the "Bushranger" faction, with the exception of Carrington, were left alive. RPC-204 was then recaptured, and afterwards, Carrington was returned to a temporary authority base 50 kilometers away. However, Lahtinen, along with his "Army" proceeded to go rogue and attacked Authority agents. The fake town of Kelly was then destroyed with a small thermonuclear device with a yield of 2 tons. This detonation lead to the neutralization of all rouge assets. Carrington was promoted to Head Researcher on RPC-204. Procedure: An additional fake settlement, known as New Siberia City, was built along the ██████ River in Alaska. No test variables would be directly modified. Instead, the CSD population would be incentivized to establish a democratic system inside New Siberia City. Due to the size of New Siberia City, 11,694 CSDs were assigned to populate New Siberia City, with over half being political prisoners or otherwise minor-penalty criminals. Results: Upon the entrance of RPC-204, An Emergency Action Notification message, broadcasted by the Emergency Alert System, was triggered. RPC-204-2 manifested exactly 15 minutes after the start of the broadcast, as with the other tests. 4 hours later, all 11,694 CSDs personnel have awakened, and proceeded to take up residence inside of the building. One of the CSD personnel discovered New Siberia City's library, which contained many books on democracy. The CSD proceeded to share the information contained within the books to his closest friends, who then spread this information further. 2 weeks after the CSD entered the library, A democratic system was successfully established inside of New Siberia City, with the leader holding the title of mayor. The original CSD, now the mayor of New Siberia City, established a police force the next day. On 2/4/1999, RPC-204 attempted to leave New Siberia City, where it was then Re-captured. Upon its capture, a vocalization was reported from RPC-204. Instead of recovering all personnel, as with the other tests, New Siberia City was left populated due to the success and findings of the experiment. However, the entire population was administered amnestics. To this day, New Siberia City remains populated, albeit under Authority supervision for psychological effects. Procedure: The abandoned capital of the island of Montserrat, Plymouth, was chosen for this test. Prior to the test, all volcanic ash was cleared out of Plymouth, to prevent early deaths of the test subjects. 4,200 CSDs were assigned to populate Plymouth, with one CSD being withheld and given unique clothing and equipment, as well as instructions to take power by force. This CSD, known later by the Plymouthites as Gas Mask, was directed to become the ruler of Plymouth. Results: Upon the entrance of RPC-204, an emergency alert almost identical to Australia's Standard Emergency Warning Signal was broadcast. RPC-204-2 manifested exactly 30 minutes after the start of the broadcast, contrary to all other tests. When all other CSDs were sedated by RPC-204, The "Dictator" CSD was brought into Plymouth. 4 hours later, all 4,200 CSD personnel have awakened. Before they could move, The "Dictator" CSD began to give a speech. Promising food and housing to the other personnel, Many cheered. Unrest was spotted as soon as day 1 of the test, when a protester was killed by "Gas Mask's" security force. Over the course of 2 months, a resistance group was spotting arming themselves with military-grade weapons. On 1/4/2000, This group of individuals entered the residence of "Gas Mask." a brief skirmish, occurring for only 20 minutes resulted in the deaths of both the entirety of the security force and the entire resistance. "Gas Mask" was killed during this skirmish." Upon the end of this skirmish, RPC-204 attempted to leave Plymouth, walking directly back to its transportation chamber. Upon the end of this test, All surviving CSDs were put back into CSD service, and an eruption of the Soufrière Hills volcano was started with a 2 ton yield nuclear device. Procedure: The abandoned city of Varosha, Cyprus was chosen as the test site. Prior to the test, all surrounding areas were evacuated temporarily, citing "Turkish Military activity." For this test, a fake cult had been set up, known as "The Sect Of Tyzen". Upon the awakening of all CSD personnel, most will be administered mind-altering amnestics, in order to falsify belief in "Tyzen". only 450 CSD personnel would be assigned for this test. Results: Upon the entrance of RPC-204, an emergency alert almost identical to Australia's Standard Emergency Warning Signal was broadcast. RPC-204-2 manifested exactly 15 minutes after the start of the broadcast, Much like all tests excluding Test 5. When all CSDs were sedated by RPC-204, Amnestics were issued to a randomly chosen 337 individuals. Upon the awakening of the CSD personnel, the first to be administered amnestics declared himself to be "The Acolyte"2. One hour after this event, The Acolyte ordered the immediate exile of all "non-believers". The unaffected 112 individuals were then forcefully removed from Varosha. Authority security cameras then captured these "Non-Believers" walking towards suspicious looking individuals outside of the testing zone. For 4 hours, a period of infighting between the affected individuals occurred, only resulting in 4 causalities. On the next day of the test, All remaining subjects were found dead via unknown means.3 RPC-204, still roaming Varosha, was then captured by Authority agents. All bodies were removed from Varosha for autopsy and disposal, and nearby settlements were allowed to be repopulated. Incident: Another test was scheduled to occur in the abandoned town of Elizabeth Bay, Namibia, involving the introduction of RPC-834 mutants into the "wasteland" created by RPC-204-2. However, before the test could even begin properly, The Church of Malthus launched an assault on the Authority's observation room, as well as the capture of all RPC-834 specimens and CSD personnel. Head Researcher Carrington was killed during this assault, but RPC-204 was able to be recovered from the site. All CSD personnel captured during this event are now confirmed Church of Malthus members.